Surprise! 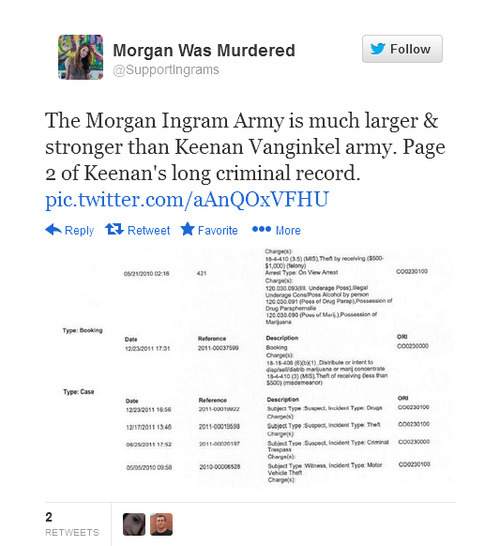 Keenan Vanginkel’s criminal history barely resembles Toni Ingram’s description. Which brings up the third piece of advice which I have found to be a very informative, and a useful tool – that is to get the criminal records of the stalker, especially a stranger stalker. As the claims that he has never been in trouble in his life grow ever louder from all of his family, the list of charges, for a twenty-one year old seem very, very, long. And most all of the charges he has been found guilty of portend to a serious problem if connected with a stranger stalker, as they are in Morgan’s case. It is not Keenan Vanginkel’s criminal record. What Toni Ingram calls an extensive criminal record is actually a global subject activity report. The global subject activity report is a record of a citizen’s interaction with law enforcement. The activity report can contain items unrelated to criminal activity. For example, if I am a witness to a car accident or if I am stopped for speeding and given a warning, or even if I am the victim of a crime, it would all be entered on my global subject activity report, A glance at Keenan Vanginkel’s GSAR shows multiple items where criminal charges weren’t applicable, including an impounded vehicle, witnessing a crime, and a trespassing accusation on Aug 25, 2011 courtesy of the Ingrams. Last week I ordered a copy of Keenan Vanginkel’s criminal history; his real criminal history. I ordered it from CBI which is the agency Toni repeatedly has said should have been brought in to investigate Morgan’s death. Click here to see Keenan’s true criminal record. Not exactly the record of a criminal mastermind ninja stalker. I know I shouldn’t be surprised at the level to which Steve and Toni Ingram will sink, yet I am. I just don’t understand what is wrong with these people. How can Steve and Toni, along with those who actively lie on their behalf, stand the very sight of themselves? Of what charge was Keenan found guilty that “portends” predicts, foretells, prognosticates, or adumbrates, pick a word any of them will do, “a serious problem” if connected to a stranger stalker? Tell us Toni, which one of Keenan’s crimes do you consider the great harbinger of future stalking events? Was it the marijuana possession or was it the drug paraphernalia charge? If smoking pot leads to stalking, most residents of Colorado should watch their backs; they could find themselves on someone’s suspect list.